Unit growth in the dollar channel is impressive. Equally impressive? Sales. 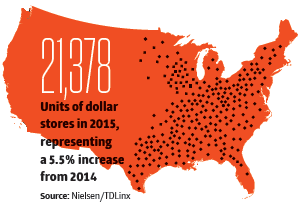 With two key players—Dollar General and Dollar Tree—the dollar channel has seen a 5.5% increase in number of locations from 2014 to 2015, compared to 0.9% in convenience, according to Nielsen/TDLinx figures. And growth likely will not slow. 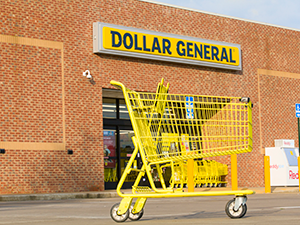 Goodlettsville, Tenn.-based Dollar General opened its 13,000th store in mid-August as part of a goal to open 900 stores in 2016 and 1,000 more in 2017. Meanwhile, Chesapeake, Va.-based Dollar Tree doubled its store count overnight to approximately 13,600 U.S. stores after acquiring Family Dollar in 2015. “These organizations benefit from economies of scale and greater efficiencies, which many c-store operators, especially single-store operators, have difficulty matching,” says Billy Milam, president of Atlanta-based RaceTrac, who called dollar stores “sleeping giants” at the NACS State of the Industry Summit in April. The dollar channel also outpaces convenience in sales. It saw a compound annual growth rate (CAGR) of 7.5% this past year, exceeding convenience (4.7% CAGR) and mass merchandisers (3.1% CAGR), says Sally Lyons Wyatt, executive vice president and practice leader for Chicago-based IRI. But even more threatening than their size and scale is the fact that dollar stores are encroaching upon the tobacco and alcohol categories and experimenting with fuel. When it comes to the tobacco category, dollar stores aren’t much of a threat now, but “the potential is there for them to become far greater threats in the future,” says Don Burke, senior vice president of Pittsburgh-based Management Science Associates (MSA). Dollar stores accounted for only 2% of tobacco sales in 2015, whereas c-stores accounted for 70%; however, total nicotine delivery in 2015 was up 15% in dollar stores vs. 1% in c-stores, according to MSA figures. “Dollar stores really are experimenting quite considerably with the tobacco category, and they’ve tried both tobacco and vapor,” Burke says. And through trial and error, dollar stores are focusing more on fast-moving items—premium and discount cigarettes and cigars—and cutting SKUs in vapor, snus, moist, loose and other tobacco. In 2015, volume of premium cigarettes was up 14% in dollar stores, compared to 2% in convenience, and volume of discount cigarettes was up 31% in dollar stores and down 1% in convenience, according to MSA. Cigars also have had a strong showing in the dollar channel: MSA found volume of large cigars was up 11% in 2015 and 55% for little cigars; in convenience, large cigars were up 6% and little cigars declined 12%. The average c-store transaction is $6.75, according to MSA data, but the basket ring for transactions that include cigarettes is $12.79, which includes $2.04 in sales from other categories. Whether it’s carbonated soft drinks, coffee, energy drinks, chocolate bars, bottled water or smoking accessories, “a lot of additional items are purchased with cigarettes that [c-stores] will lose,” Burke says. As for the alcohol category, “any retail channel that identifies alcohol, beer in particular, as a strategic priority poses a threat,” says Donna Hood Crecca, associate principal for Technomic, a sister company of CSP. Dollar General has been selling beer and wine at some of its stores since 2008. It now sells these products at about 7,000 sites. And, as it was mentioned at the NACS State of the Industry Summit, the discount retailer has grown its alcohol sales by more than 250%. To combat this threat, “understand who the core beer consumer is for the particular c-store chain and whether that consumer would be enticed by the competitive dollar store’s beer offerings,” Crecca says. And while Dollar General isn’t completely new to fuel (it has a fueling station at one of its larger-format Dollar General Market sites in Hanceville, Ala.), the retailer really threw down the gas gauntlet when it purchased 41 former Walmart Express locations earlier this year. The company said it intends to operate the gas stations at 37 of those sites. “Any time one channel begins to blur into another, we need to make certain it’s on our radar,” says RaceTrac’s Milam. The Dollar General Market location in Alabama began selling fuel in 2013 as part of a pilot project with Mansfield Oil Co., Gainesville, Ga. And the potential is there for more fueling stations at dollar stores. “They have the reach, the real estate and the efficiencies to make it work,” Milam says.